Economists have written scores of papers on the topic dating back 100 years, and the vast majority of these studies point to job losses for the least-skilled. They are based on fundamental economic reasoning—that when you raise the price of something, in this case labor, less of it will be demanded, or in this case hired. Among the many studies supporting this conclusion is one completed earlier this year by Texas A&M’s Jonathan Meer and MIT’s Jeremy West, which reaffirmed that “the minimum wage reduces job growth over a period of several years”… An extensive survey of decades of minimum-wage research, published by William Wascher of the Federal Reserve Board and me in a 2008 book titled “Minimum Wages,” generally found a 1% or 2% reduction for teenage or very low-skill employment for each 10% minimum-wage increase. …let’s not pretend that a higher minimum wage doesn’t come with costs, and let’s not ignore that some of the low-skill workers the policy is intended to help will bear some of these costs. The column also exposes some of the methodological flaws in studies that claim high minimum wages don’t lead to job losses, so the entire piece is worth reading. Since we’re on this topic, here’s a great table prepared by Mark Perry of the American Enterprise Institute. 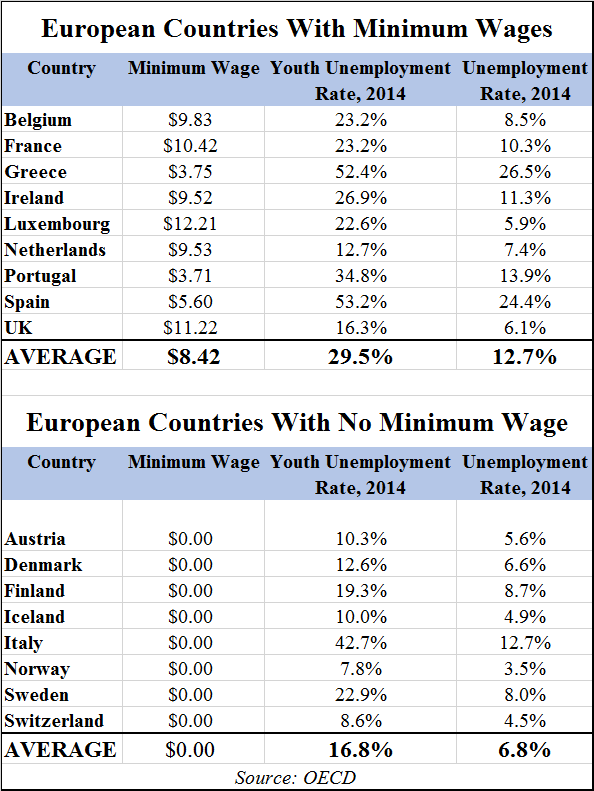 Is anyone shocked to learn that countries with minimum wage mandates have higher unemployment levels, particularly for young people? I have two big observations and two minor comments in response to this data. The first big observation is the caveat that minimum wage mandates are just one piece of the economic puzzle. The numbers if Greece, for instance, are miserable for many reasons. 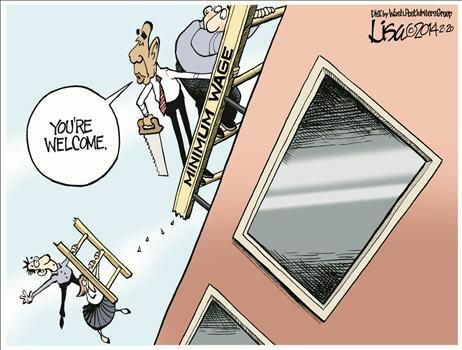 The minimum wage mandate is just another straw on the camel’s back. Moreover, it’s possible for a nation to have a decent-performing economy with a minimum wage (see Luxembourg) and a decrepit economy without one (see Italy). It’s the overall burden of government that matters, which is why the rankings from Economic Freedom of the World are the first place to look when determining if a nation is market-oriented or statist. That being said, Mark’s data certainly shows a correlation between joblessness and minimum wage mandates. Part of the reason for this link is that higher minimum wages are bad for employment, and part of the reason for the correlation is that governments foolish enough to impose minimum wages are probably foolish enough to impose other bad policies as well. The second big observation is that I periodically encounter leftists who say a minimum wage is needed because employers have all the leverage and would pay workers starvation wages in the absence of a mandate. To which I always respond by asking them, “Then why don’t employers use that leverage to reduce the wages of the 98 percent of workers who make more than the minimum wage?” That shuts down the conversation very quickly. But now I’ll also ask these folks, “And why aren’t workers in Austria and Sweden paid starvation wages?” Their responses will be amusing. For my minor comments, I’ll start by noting that Switzerland is a uniquely sensible nation. Voters recently rejected a minimum wage mandate by an overwhelming 3-1 margin. I fear American voters would not be nearly as sensible if we had a national referendum. My second minor comment is to share this amusing report about Belgian politicians whining that the lack of a minimum wage in Germany (at least as of 2013) was causing “unfair” competition. Oh, the horror! Last but not least, let’s recycle this great video from the Center for Freedom and Prosperity. If you have friends and colleagues who lean left but nonetheless are open-minded, please share this video with them. And let them know that even Janet Yellen of the Federal Reserve has acknowledged that minimum wage mandates are recipe of joblessness. P.S. I wrote a few days ago to identify several statist policies that cause inequality. Well, I’ve added to that list because it turns out that red tape also can unjustly line the pockets of the rich at the expense of the poor. Make sure to check out the updated version of that post.